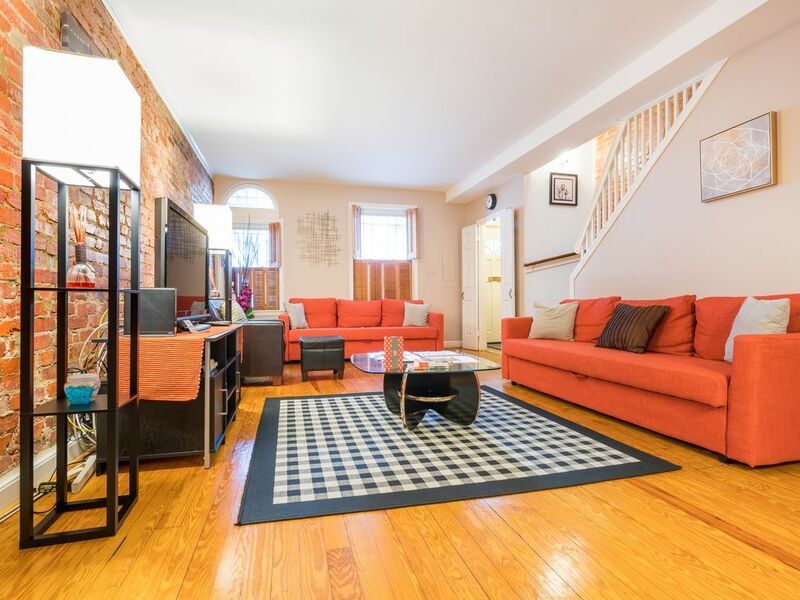 This is a beautifully renovated home located within walking distance to all the major sites and attractions DC has to offer. Centrally located near the Downtown Business District, only a 15 minute walk to the DC Convention Center, Chinatown, and Union Station. The Metro station is a short 10-12min walk from the home (New York Ave Station - Red Line) and is the best form of transportation to all area attractions such as: The National Mall, The Smithsonian, Museums, and the world famous Cherry Blossom Parade & Festival. Walk 1 block to North Capitol Street and get a wonderful view of The Capitol. Terrific dining, shopping, and entertainment is nearby on the U STREET CORRIDOR. We offer FREE off-street parking! Property Address: 40 BATES STREET, NW, WASHINGTON, DC 20001. The Bates Street Suites is a 2-level row house with (3) bedrooms, (2) full baths, and (1) half bath. It comfortably sleeps (10) guests. Bedroom (1) contains a Queen-sized bed with private bath, dresser w/ mirror, huge walk-in closet, access to deck, & TV. Bedroom (2) contains a Full-sized bed, dresser w/mirror, & TV. Bedroom (3) contains a Queen-size bed, futon, dresser w/ mirror, & TV. In addition, there are also two full-sized futons in the Living Room. The property features a fully-stocked kitchen, washer & dryer, newer appliances, dishwasher, microwave, blender, coffee maker, pots & pans, & Flat Screen TVs. We have also lots of exposed brick walls, great sky lights, free telephone service, satellite cable, high speed internet access with WI-FI to surf the web anywhere in the house or outside on the deck. A NON-REFUNDABLE $49 Property Damage Protection is required. DC Lodging tax is 14.5%... DUE TO THE ECONOMIC CONDITIONS, WE'RE NOT CHARGING TAX!!! I handle the business & marketing side from the background whereas my Property Manager does all the hard work. Our guests really appreciate his efforts and makes a note of it in the reviews. I chose to convert my home into a vacation rental based on demand in the DC market. I believe you will feel very comfortable. It feels like a home away from home. Free off-street parking, holds two cars. Fully furnished you do not have to bring anything! We enjoyed our stay thoroughly but had a ton of trouble locking the door. Per the manager there had been damage done to the door a week prior to our stay and it hadn’t been completely fixed. Other than that we had a great time in the house and cooked a lot. Very spaciois and clean. I was nervous after reading all the reviews of this neighborhood being possible unsafe but was glad to find out that is untrue. Always felt safe. There is an excellent cafe called Big Bear where I had breakfast everyday, only 5 minutes walking. The walls are quite thin but I think that's the case with all these older townhouses. I would recommend this place. Great place. Very convenient to Convention Center. Very conveniently located to Convention Center. Great place, kitchen well stocked with cooking ware. Also has a washer-drier. Sleeps 6 comfortably. The orange pullout sofas are surprisingly comfortable sleeping beds. Will definitely use again. This would have been a 5 star review if our stay had gone differently. We'll start with the positives. The property is family friendly and great for entertaining. The 2 parking spots out back plus the street parking pass are wonderful for guests. All of the bathrooms and bedrooms are a great size and the living room is wonderful for relaxing. The property is a quick walk to get to the metro. All of the neighbors we talked with were super friendly. That being said, all of the positives could not outweigh the cockroach problem we dealt with. We saw the negative review in October about cockroaches so we reached out to the property manager to see if the problem was being treated. Sherman responded with "Hi, I understand your concern. We have address the pet control issue and it's under control, you will not have a problem with. Thank you!" It was our surprise when we were washing baby bottles the first night that a cockroach walked across the counter next to our drying pad. We immediately reached out to Sherman who apologized the next morning and said they would get pest control out immediately. That was on 11/22/18. On 11/23/18 we reached out to Sherman again after a member of our party had a cockroach on his arm while in the kitchen. Sherman requested pictures of the incident instead of believing us. It was not until 11/24/18 that we got someone to the house to treat the issue. I do not know if the house was or was not treated before our arrival. We did not see any dead cockroaches unless we were killing them. When we stay in Florida, we know to expect cockroaches but we always see them dead instead of being active and living. The cockroaches were active in the guest bathroom upstairs and were walking on the towels, they were in the dishwasher and all over the kitchen, dishes, drying rack and washer/dryer. At one point a drink was sat down on the kitchen counter and a cockroach was in it within 3 minutes. The cockroaches made the kitchen unusable. We do have pictures and videos of the issue but this site does not allow for pictures to be uploaded. This review would have been totally different if it wasn't for the cockroach issues. The reason we continued to stay at the property was because the rest of the house was great. We just avoided the kitchen and had to be very vigilant in the bathrooms. The space is very unique and has an interesting layout. Beds are comfortable and the neighborhood/location was great. A good spot for a big group. The kitchen is well equipped except for a few pots that needed the handles tightened and a few miscellaneous items that we needed to acquire to prepare a holiday dinner. The knives were, however, quite dull. Overall there are some details that could be updated such as the fact that one guest was stuck in a bathrooom because the knob could not be operated from inside. And as the signage indicates, even a small amount of food left out will attract insects. While one of our guests was napping someone used the door code and entered the house. The people were hired by the manager and everyone was confused. In the end everything was ok, but it seems that some communication could have been better (and the guest was a little distraught that people were entering unannounced). Overall a good 5-day stay. Great location, handy to the metro and all of it's access to DC. Groceries and restaurants are close and varied. So glad to hear you found the home convenient & in a great location .